Food Costs > How Much Does Lump Crab Meat Cost? How Much Does Lump Crab Meat Cost? Lump crab meat, sometimes referred to as Backfin meat, is the extra large portions that are removed from the crab body, is highly valued for its soft, sweet, and delicate taste. Unlike the meat in the legs, this meat is from the heart of the body, which is very little in most blue crabs. 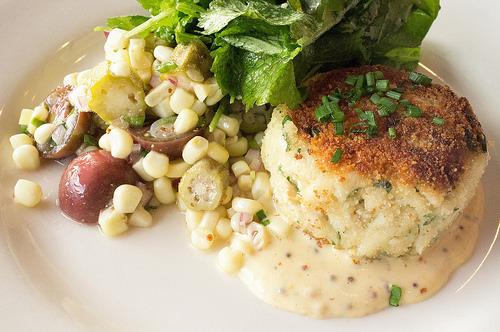 This type of crab meat is typically used to make crab cakes, salads and is often used by manufacturers of pre-made recipes. On average, plan on budgeting around $17 to $48 per pound. The cost will depend on where you buy it, where you live, how you buy it and the time of year. Inside of a can, lump crab meat can cost about $3 to $6 per six-ounce can, depending on the retailer and where you purchase it. At Walmart, for example, the Crown Prince lump meat brand retails for close to $4 per six-ounce can or less than $1 per ounce. Amazon.com, on the other hand, offers lump crab meat in bulk. Its best seller, Miller’s Select lump crab meat, for instance, retails for about $2.75 per ounce. On this ChowHound.com forum thread, the prices they had paid ranged anywhere from $28.99 per pound at a local seafood market in California to as little as $17 at the local Costco. Fresh lump crab with either be pasteurized, sealed inside of a can, or if it’s fresh, it will be processed and stored inside of a plastic container. Fresh lump crab meat has a shelf life of about four to five days, but when pasteurized, however, it can be kept for several months as long as refrigerated. Regardless of how it’s purchased, both fresh and pasteurized lump crab meat will already be cooked and ready to be used in any recipe. There are two types of “lump” crab meat: jumbo lump and lump. Jumbo lump crab meat consists of the two larger muscles that are connected to the swimming fins of the crab, whereas lump crab meat is merely a blend of broken pieces of jumbo lump and special grade crab meat. Shipping is usually charged separately if purchased online since it has to be on your doorstep within 24 to 48 hours at most. This meat is regarded as one of the best crab meats due to its sweet taste and hearty texture. Lump crab meat is white in color and will be the best choice when color is important in a recipe. Crab meat is very low in calories, making it a healthy addition to any diet. Crab meat is also low in fat, making it heart healthy. Omega-3 fatty acids, which can increase memory and decrease the risk of heart disease and cancer, can be found in large quantities of crab meat. While a lot of seafood contains a high amount of mercury, crab meat does not pose this risk. Crab is also a good source of vitamins A, C and the B vitamins, including B12, and minerals like zinc and copper. It is a source of selenium, which may be a means of preventing cancer. Crab also has some chromium, which is considered a useful mineral if you have insulin resistance, as it may improve blood sugar metabolism. According to most who often purchase lump crab meat, many recommend checking out local Sam’s Club and Costco for the best deals and taste.